Whatever the weather is near you, extra treats high in protein for your hens are always a good idea. It helps with feather production, higher quality eggs, and boosts their moods. (Who doesn't feel happier with a mouth full of food?) . This week only, when you treat your hens to PowerHen 4 or 8 pound bags, you'll also get a free bag of Black Soldier Fly Larvae – YUM! . Hens love picking at the flowers and non-GMO wheat berries in PowerHen, and go BANANAS over the dried mealworms and shrimp! . 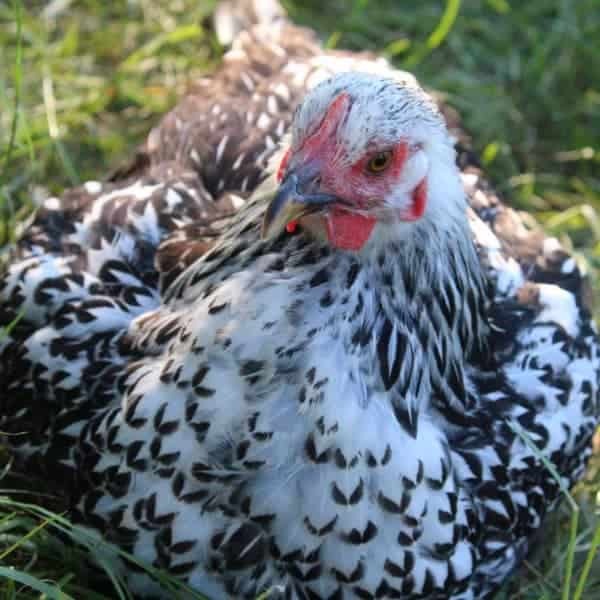 You'll also hear them clucking for joy over the soothing rose petals, rose hips, wonder-herb calendula, and immune supporting hibiscus flowers. . And this week only, your hens will get an extra goody bag of black soldier fly larvae! . Link in photo! Well, yesterday started out at 50 degrees and quickly disintegrated into 30 degrees with snow, sleet, and ice. And to top it off, the thunderstorms from the previous night dumped so much rain on us, that one of my temporary coops collapsed. . During an ice storm. With wet hens running around in 30 degree, windy, weather. . But this also made for an interesting night, because the coop collapsed in a way so the chickens could move around, but it was really hard for a human to get in and out of the coop. . Which meant collecting them to move them to the main coop (which was toasty and dry) was a barrel of monkeys, and I learned how to be a very quick contortionist. . Everyone was covered in ice and snow, and had frozen feathers sticking to them. What a NIGHTMARE. . I ended up putting the roosters in my cabin office (because some of the roosters in the temp coop were there because they're aggressive to other roosters), and the hens in the main coop where they could huddle with the other hens for warmth. . Everyone was toasty and dry this morning! It's still pretty chilly here, but the hens don't seem to mind! Chickens do well in cooler temperatures, so I'm not surprised. . We've tried fixing the temporary coop, but with the ice, it's going to take a minute. So, we're trying to work out what we'll do with all our extra roosters who lived there. . Meanwhile, I moved a couple hens from the main coop into the baby tractor to completely separate them from roosters. They've started laying eggs again, which goes to show that roosters who harass hens can DEFINITELY effect egg production. One of my hens laid this beauty today. We've had wonky weather – 50°, then snow and ice, then back to 50° again. I guess it's getting to them! I'll be adding Best Eggs Ever! to their nesting boxes this week. FINALLY I've been able to unlatch the door to the chicken run. Between the rain, ice, and freezing temperatures, the door was frozen shut! . I could get in and out of the coop, but the fluffy butts were on lockdown for 2 days. I think the ducks were about to kill me. . What's funny is most of the hens still refuse to leave the coop – there's a lot of space, free choice feed, and plenty of BEE A Happy Hen (a blend of Non-GMO Wheat, herbs, mealworms, and bee pollen), so I think they don't see the point. . I'm pretty sure we're gonna have to build a new coop for the roosters, now that the temporary coop hasn't survived the onslaught of winter. . I was hoping we could save the temporary coop – as ugly as it is, it's basically a big tractor. In the ridiculously hot summers we have here, it's perfect because it has great ventilation and it moves easily. . So, we're coop shopping, which means we might buy a coop or we might build one. I haven't decided. In addition to Best Eggs Ever! we've been adding Calendula to our nesting boxes. The scent relaxes the hens, especially since we moved my roosters out of the main coop (well, 3 of them. We left the silkie roos and my Blue Copper Marans rooster in). I'm loving the lavender eggs one hen is laying!